First morning. Systems not quite in place yet. Awkward timing – my apartment lease ended this week and my work contract finishes in three weeks, after which I’m cruising around California for a bit before heading back to Boulder CO. Housing for three weeks, what to do, what to do? 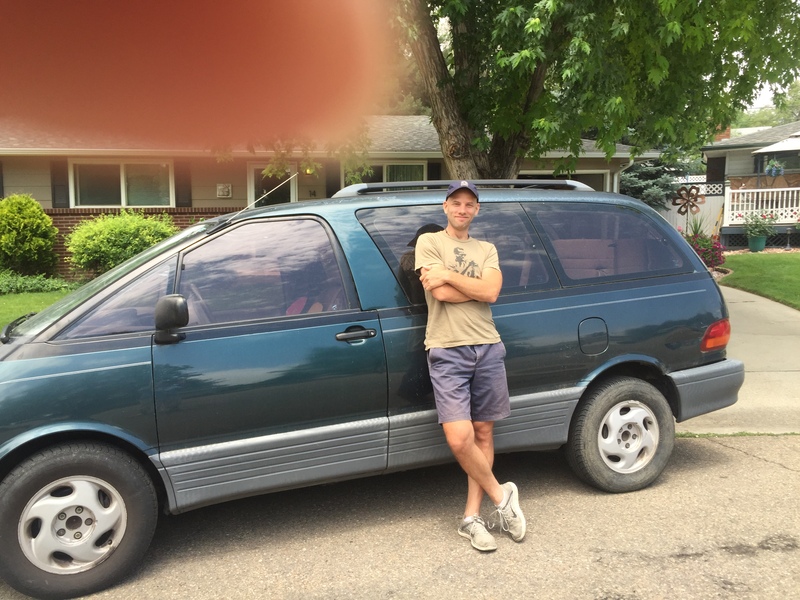 Three days ago I moved from the apartment into my 1994 Toyota Previa minivan. I love it. When I first moved to LA five months ago I thought I might live in the Previa but I let math and fear stop me. The math was based on the amount I would spend on food compared to having a kitchen to prepare food in. Sure I’d save x amount on rent, but the extra amount I would spend on daily prepared food would eat up enough of the savings that I thought it was worth it to have a bedroom and bathroom. Because after food prep, having a shower was my main concern. Which brings us back to day three of #vanlife. I haven’t showered since moving in and I haven’t prepared any food yet. I’m not worried about the food part because after I bought the van I cruised around Colorado for a couple weeks. At the time I was a recent convert to a whole-food plant-based diet and the food I cut up and tossed together was beyond satisfying. I still eat that way – whole food, plant-based, tossed together veggies – but with access to a kitchen I was doing exotic things such as cooking rice and sauteeing greens. Before switching to wfpb I was more-or-less paleo. One of the joys of eating in my current manner has been the reintroduction of whole grains (Paleo anathema) to my diet. I still don’t eat much bread – it’s more of an occasional treat because I have unscientific gut-based suspicions about gluten, but if I find myself near a killer bakery I’ll buy some whole grain bread and see what’s up. But I freaking love oatmeal. (And yes I know oats have gluten. Whoaaaaa, just looked it up, oats are gluten free! Who knew?). Every weekday morning I love it, the most mindful thing I do all day is open my Tupperware (Rubbermaid) container of oatmeal (I love it cold as well as hot) and look at it so gratefully, it’s full of so much goodness and love and then I eat it, a spoonful at a time. And even though I’m alone I don’t even look at my phone while eating it, that’s how much I love it. So I had fear about being able to have oatmeal every morning. And here I am on day three having had my last portion of my superfood-packed oatmeal yesterday, which is fine because I usually mix things up on weekends. Mix things up as in don’t eat oatmeal and mix things up as in mix up a big batch of oatmeal. I’m fortunate to have a great friend in the lovely Giuliana, and when she found out I was moving into my van she texted, “No! !” and “This makes me sad.” She really was and she offered me her place as a roof over my head should I so desire one. I don’t foresee so desiring – the van is insanely cozy, warm, and comfortable due to a pretty spiff inflatable mattress which doesn’t allow me anywhere near the van floor – but a shower and a once-a-week kitchen are handy to have, and she and I do enjoy food and cooking. I’m on my way right now to clean up and cook a week’s worth of oatmeal. And that’s the first three days, gotta go. In #vanlife, as with the #restoflife, we’ll see what happens.